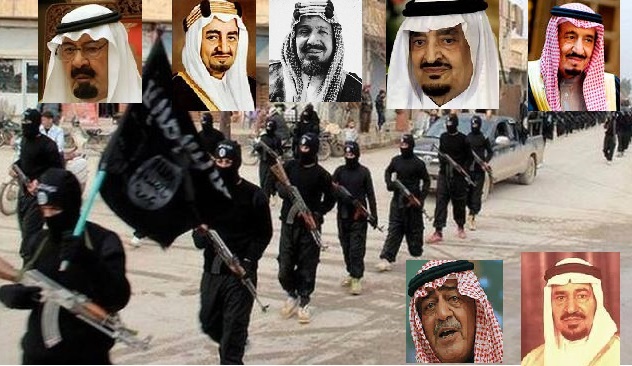 JNN 02 Apr 2015 Riyadh : In the recent last Three Decades if you Probe any event of terrorism or extremism around the World the Roots of it will most Probably be linked to Saudi Bred Wahabi Ideologically trained terrorists . It may be claimed by Al Qaida , Taliban , ISIS , Boko Haram, Al Shabab , or any other terrorist Organization , But the Masterminds of any such terrorist attack come from the same set of People , Nurtured in the Saudi Bred Wahabi Ideology ,which Is in contrast to the set Principle of Islam even , but even then they call it their Islam , while at the same time they call all the followers of Islam infidels and according to the their Ideology all Human Beings , who are not on their Ideology are Likely to be Killed . No matter which organizational connections (if any) ultimately prove to be real, one thing is clear: the fountainhead of Islamic extremismthat promotes and legitimizes such violence lies with the fanatical “Wahhabi” Ideology centered and Nurtured in Saudi Arabia. And if the world wants to tamp down and eliminate such violent extremism, it must confront this primary host and facilitator. This appears to be a monumental campaign to bulldoze the more moderate strains of Islam, and replace them with the theo-fascist Saudi Ideology. Despite being well aware of the issue, Western powers continue to coddle the Saudis or, at most, protest meekly from time to time. For instance, a Wikileaks cable clearly quotes then-Secretary of State Hillary Clinton saying “donors in Saudi Arabia constitute the most significant source of funding to Sunni terrorist groups worldwide.” She continues: “More needs to be done since Saudi Arabia remains a critical financial support base for al-Qaeda, the Taliban, LeJ , LeT and other terrorist groups.” And it’s not just the Saudis: Qatar, Kuwait and the United Arab Emirates are also implicated in the memo. Other cables released by Wikileaks outline how Saudi front companies are also used to fund terrorism abroad. In fact, Saudi blogger Raif Badawi’s wife, Ensaf Haidar, made a similar observation about her husband’s flogging: “the Saudi government is behaving like Daesh [a Short form of Arabic term for ISIS i.e. Daulat e Islamia Iraq O Sham ].” About 2,500 Saudis are thought to be in ISIS’ ranks. But it is also a problem where the West can help by stopping its historical pandering and support of Middle East tyrant Dictators who spread this extremism. The most fundamental way to make the message clear to the House of Saud would be to threaten to stop buying oil from them. Given the relatively cheap oil prices these days it need not be an empty threat. The fight against ISIS and Al-Qaeda is deeply ironic since these organizations were created and are sustained, in part, by funds US & West hand over to the Saudis and Gulf Arab nations to purchase their oil. And while France mourns its cartoonists and police officers, the French government is busy signing military and nuclear deals worth billions with the Saudis. If this continue down this road, it may well be a never-ending war. And the Latest attack of Saudi Arabia on Yemeni Population is Ironis , which they have done as they say that they might be under threat from the Revolution of the Masses in Yemen , against the Corrupt , Incompetent and Impotent Govt , which was even toppled by the Revolutionaries , But as the People leading the revolution are allied with the Shia Sect of Islam , who the Wahabi Ideology treats as their Biggest enemy, so at Present they have attacked Yemen , and are still carrying out Air Strikes against the Yemeni People who have Just risen to demand for their Legitimate Rights , But as the Saudi Monarchy is itself a Dictatorship , and there is a Uprising Movement within Saudi Arabia , as 66% of Saudi Population Live under the Poverty Line , while only the Royal family and their close associates enjoy all the Luxuries of Life , at the cost of the Poor People of the Nation , whom God has gifted with the Lot of Natural Resources , which can change their Life and can Bring Prosperity in their Life Style , but Due to the Unjust system of Monarchy , the Rich are getting Rich every day , while the Poor are getting Poorer every day . So in this context the Saudi Monarchy is afraid that if the Yemeni Revolution succeeds then , it may spill over across the Border and this is the reason that they are afraid of the Pure People Revolution across the Border in Yemen , and are trying to crush it with full force they have to save their Monarchy , which they have even Usurped about 85 years ago from the Turkish Ottoman Empire with the Help of their Western British Masters. The House of Saud works in the best interests of the West and the against the Muslim world. Muslim communities worldwide certainly need to eradicate fanatical Wahhabism from their midst, but this will be difficult, if not impossible, to accomplish if the West continues its support of the House of Saud. The monarchy is deep rooted with Wahabi Ideology , which is based on Injustice , terrorism and Intolerance , and which cant be modernized and modified – so the solution of it is to simply uproot it and replace it with Real Democracy , and Not Sham Democracy as Done in the case of Egypt , Pakistan , or other Nations which Have the worst example of Democracy , as where stooges are Implanted by the Western World to Rule the Nation through their Implanted stooges. This entry was posted in Jafria, Middle East and tagged Ale Saud, Saudi Arabia, saudi monarchy, Wahabi, Wahabism. Bookmark the permalink.